In response, Johnna Holmgren of Fox Meets Bear told BuzzFeed News her book is meant for "adventurous eaters." Johnna Holmgren is an Instagram influencer and blogger who goes by the name Fox Meets Bear. Holmgren lives in Minnesota with her husband, Max, a chalk artist, and their three daughters. She chronicles their life living in the woods, foraging for food, cooking, and crafting. Her incredibly pleasing Instagram aesthetic has earned her over 125,000 followers on the platform. In May, Holmgren released her first cookbook, which was called Tales From a Forager's Kitchen. It contains recipes using food that readers can forage on their own from the forest, including wild mushrooms, flowers, and berries. Holmgren's aim with the book, according to its description, is to help people regain an "appreciation for the earth." "She's someone who goes straight to the woods behind her home for mushrooms and syrup and heads to her garden for tomatoes and fruits," the book states. "Her cookbook is more than just a book —it's an escape to another realm, a retreat into nature, and a taste of the life she lives." However, her book has come under scrutiny from readers on Amazon, who claim her recipes could make readers sick. Holmgren and her publisher, Rodale Books, said in a statement to BuzzFeed News they are "taking the discussions about [Holmgren's] book very seriously." "We are reviewing its text closely," they continued. In an email to BuzzFeed News, Holmgren said her cookbook is meant for "adventurous eaters." "We have personally eaten raw mushrooms and have no had negative experiences," she said. 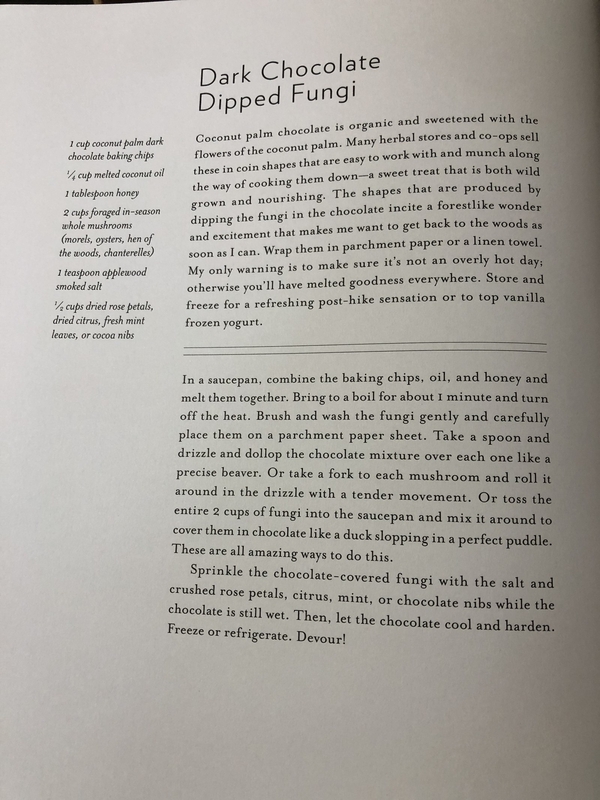 One recipe that has caused concern is Holmgren's recipe for "Dark ChocolateDipped Fungi." She tells readers to use "two cups of in-season foraged mushrooms," with morel mushrooms being one of the suggested varieties. 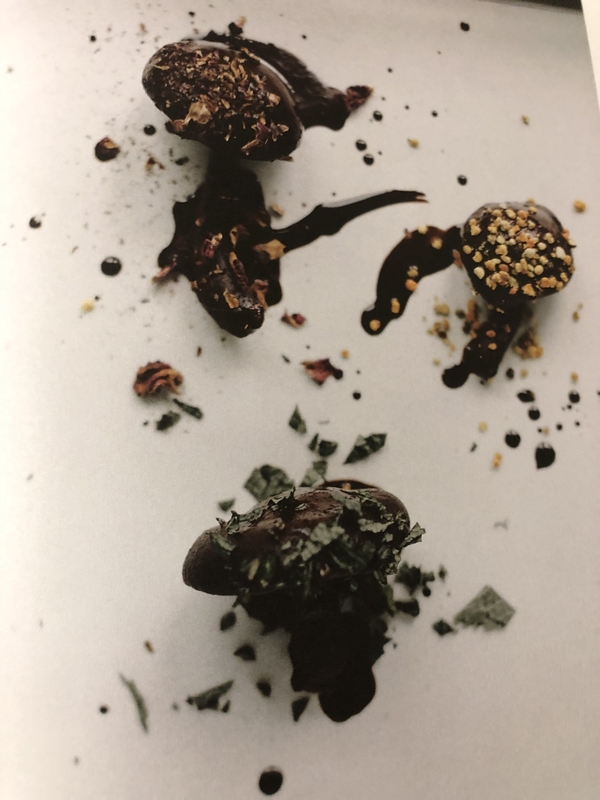 The recipe then instructs the reader to brush and wash the fungi, place them on parchment paper, dip them in melted chocolate, sprinkle them with salt and rose petals, and then place them in the fridge or freezer to cool. The problem is that morel mushrooms can make people sick if eaten raw. According to the Michigan Department of Community Health, consuming raw morels can lead to "nausea, vomiting, and abdominal pain." The symptoms usually take hold within a few hours of eating the morels raw or undercooked, according to MDCH. In fact, Richard Pizarro of the Minnesota Mycological Society told BuzzFeed News "as a general rule, no wild mushrooms should be eaten raw." He said while eating the morels and other edible mushrooms raw will not kill you, "your digestive tract will not be happy." He said this is because some of the mushrooms are hollow and can collect debris, and that the "cell walls of mushrooms are made of chitin." "Chitin is also in the cell walls of the exoskeleton of crabs, shrimp, and insects," he said. "This is a very difficult material for our bodies to digest and may cause noticeable discomfort. Cooking the morels breaks down the chitin and makes the mushroom more easily digestible." In addition, it generally takes an expert to safely collect and eat wild mushrooms because some of them can be dangerous, even deadly, and it's easy to mix up species. For example, people looking to collect morels sometimes pick and eat "false morels," instead, leading to potentially serious side effects. These "false morels" can make you sick if you eat them, according to the Children’s Hospital of Michigan Poison Control Center, which noted that in 2011 several children had become ill from consuming them. The mushrooms contain a toxin called gyromitrin, which harms the liver. Initial symptoms include "nausea, vomiting, abdominal pain, diarrhea, dizziness, headache, muscle cramps, bloating, and fatigue." If untreated, the toxin can lead to confusion, delirium, seizure, and coma. Now, readers of the book are attempting to warn others about the potential dangers. One Amazon commenter wrote they are an "avid forager and chef" and immediately spotted the danger of the chocolate morel recipe. "That's a pretty big no-no," the reviewer said of the recipe. "Morels need to be cooked first to be safe for human consumption." "Eating an uncooked morel is against everything that is taught," said another reviewer. Readers also were concerned about a smoothie recipe that included frozen, raw elderberries. The risks of eating raw elderberries are less clear. Christopher Patton, president of the Midwest Elderberry Cooperative, told BuzzFeed News the berries contain glycosides, which are also found in apple seeds. Eating them, like eating an apple core, does make some people sick. Patton said new research has indicated there are actually fewer glycosides in raw elderberries than in an apple seed. However, he pointed to a statement from the elderberry cooperative website, which says "some few people seem to be strongly affected by consuming raw elderberries or elderberry juice, where it upsets their digestive system. Why they have a lower tolerance for elderberry is not clearly understood." Sherrie Hagenhoff, another elderberry farmer who is a member of the cooperative, told BuzzFeed News that the side effects of the berries seem to depend on the amount eaten raw. She said that she has had people on her farm who have eaten a few of the berries and reported no side effects. However, she said that "they should be heated or fermented if one wants to consume a larger amount." Holmgren told BuzzFeed News she has personally made the smoothie recipe containing elderberries for her family, and had "no adverse reactions whatsoever." "The small amount called for in this recipe is not dangerous," she said. Another recipe includes foraged acorns, which are peeled. Then, their meat is "sizzled." In terms of acorns, they can be consumed after undergoing a process called "leaching," which removes a chemical called tannin. The issue with tannin is that it tastes terrible and would probably make most dishes inedible. Philip Stark, a professor at University of California, Berkeley, and the founder of Berkeley Open Source Food, told BuzzFeed News that he is "sure that eating enough tannin will upset your stomach, but I think it would be hard to do, because it tastes pretty harsh." He said most recipes involving acorns call for soaking the acorns for several days to leach out the tannin or grinding the acorns into flour and using boiling water. Some reviewers also found issue not with the safety of the recipes, but with the recipes themselves. One reviewer said Holmgren's "Minnesota Wild Rice French Toast" was inedible because it instructs only to "soak" the rice, not cook it. Holmgren told BuzzFeed News that her advice to readers is “document your findings" and "be certain you are 100% sure of the species and their identification before consumption."